The Icom IC-R75-22 receiver continues the proud tradition of the earlier R70 and R71A models. With full coverage from 30 kHz to 60 MHz; all longwave, medium wave and shortwave frequencies are supported plus extended coverage to include the 6 meter amateur band. Some of innovative features of the R75 include: FM Mode Detection (but not the FM broadcast band), Twin Passband Tuning, Two Level Preamp, 99 Alphanumeric Memories, four Scan Modes, Noise Blanker, Selectable AGC (FAST/SLOW/OFF), Clock-Timer, Squelch, Attenuator and backlit LCD display. Early production units featured synchronous detection. Tuning may be selected at 1 Hz or 10 Hz steps plus there is a 1 MHz quick tuning step plus tuning Lock. The R75 exhibits very impressive and very linear sensitivity throughout shortwave. Superior dynamic range insures the handling of both weak and strong signals. The front-firing speaker provides solid, clear audio. The back panel includes a Record Output jack and Tape Recorder Activation jack (both 3.5mm mini). There are both Hi-Z and Lo-Z antenna inputs. 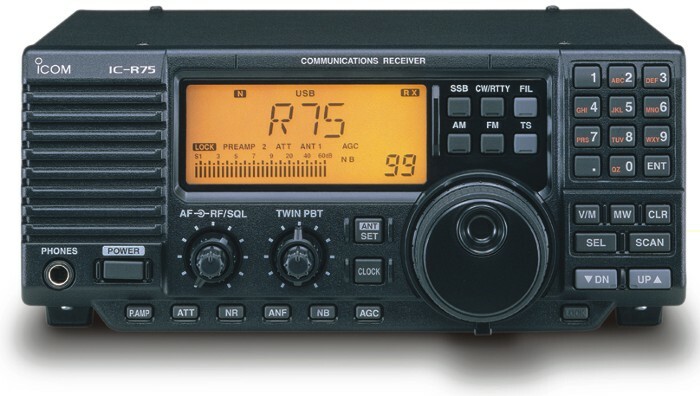 The IC-R75 is an excellent single sideband (SSB) receiver. The supplied 2.1 kHz SSB filter is suitable for utility, amateur, or broadcast SSB. However, two optional CW/SSB filter positions are also available (one per I.F.). Click here to view filter chart. The built in 24 hour clock timer is very versatile. You can program the radio to come on and power off at specific times. There is also a sleep function that will turn the radio off after a set period that can be set from 1 minute to 23 hours and 59 minutes. The R75 comes with the AD-55S-12 external 100-240 VAC 50-60 Hz to 15 VDC power supply adapter. Optional filters do not require soldering. 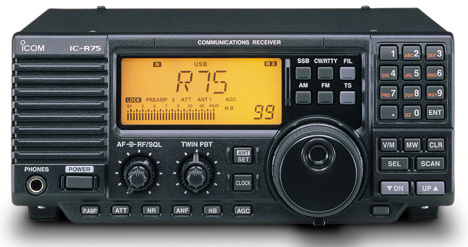 The UT-106 DSP Unit was included and installed by Icom in later production. #0521 AD-55S-220V External 100-240 VAC to 15 VDC 2 Amp power supply. Round tip Euro plug. RS-R75 Windows 95/98 (not XP!) PC Software CD and DB-9 Serial Cable.